Camping In The Rain Tips, Checklist and Things To Do | Let's Find Out! Rainy days used to be considered as sad and moody days, but no, you can totally enjoy the rain days by camping in the rain. Fall is the best time ever to immerse yourself in nature, trekking in the forest, take pleasure in peaceful and picturesque scenes of yellow and red leaves crunching underfoot and get a sniff of fresh and wet air. It will be regretful if you miss out this treasure of mother earth. Therefore, today I write this article to share with you my own unforgettable experiences and useful tips when camping in the rain. 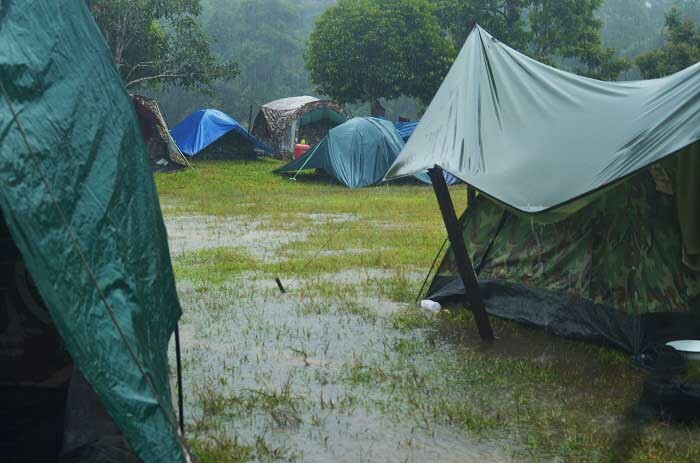 I’m pretty sure that you don’t want to be in “not to know whether to laugh or cry” situation when you’re camping in heavy rain, your tent is dripping wet and you are as wet as a drowned rat. Hence, always remember to bring a waterproof tent. Perfect rain tents are processed with waterproofing polyurethane. You have to consider seriously the location where you’ll set up the tent. Firstly, you should choose an elevated campsite. Be noticed that it is highly dangerous when you’re camping under heavy and dense tree branches because they could fall down on you if gale or heavy rain happens. Moreover, pay attention to the water levels of nearby rivers and don’t ever camp near the rivers. It is totally not fun when waking up at 3 AM and be laid low in four inches of water after it rained cats and dogs. Finally yet importantly, stay away from the highest geographical point because the rains usually come along with lightning. Bringing convenience foods that don’t require cooking could be extremely beneficial when you camping in the rain. You can keep your stomach full by eating nuts, noodles, chocolate bars, sandwich with a piece of ham and cheese. Remember that the tarp is angled to be sure that the rainwater runs off the sides opposite to your tent. You can bring multiple tarps and lay them to other areas if needed. Unroll your groundsheet on the floor to create a comfortable accommodation. 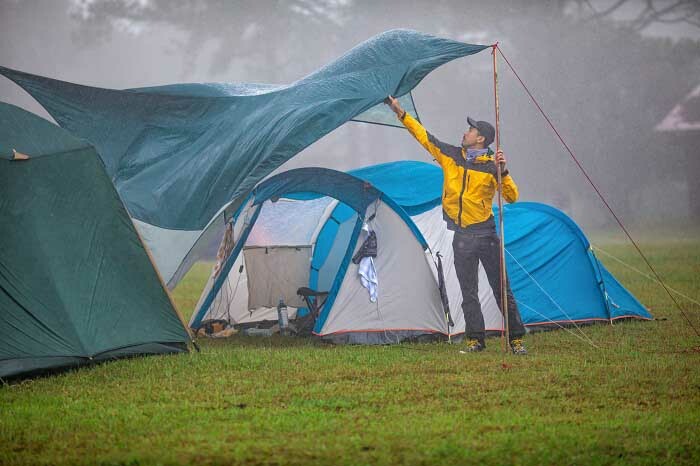 Just lay it inside your tent, don’t place it outside if you don’t want rainwater to overflow into your tent. Nobody wants to camp in the rain and spend all time staying or sleeping in the tent. Therefore, you should pitch more than 2 tarp shelters to create larger space. One for dining/cooking/games areas and another for relaxing and reading books, talking zone. Bags are also necessary when traveling in rainy days. Always pack your personal and important items in plastic bags which are water–resistant to protect them against water. Furthermore, you should bring 2 types of bags: small size and big size. Use the small – size bag to contain small things like money, keys, smartphones… and use the larger one to wrap your clothes, your sleeping bag, and campfire fuel. Before the rain falls down, the wind starts to blow heavily. Therefore, if you put your stove near the tent, the tent could easily catch fire and start to burn. You should avoid cooking inside the tent because it could put you at risk for CO2 poisoning. Don’t ever challenge yourself or put yourself at risk when trying to get the balance on grassy or mossy rocks. It’s not cool at all. Make sure to wear hiking sandals or hiking boots with loads of ankle support when trekking around these areas. In case there is a heavy rain and the water level increases, you should dig a drainage tube so the water could flow out to another direction. Keeping your fire going could help you eliminate undesired dangers from wild animals such as snake, tiger, scolopendrid, etc. So, you should bring sufficient dried firewood, old newspapers to light a fire and keep your fire going as long as possible. Drinking rainwater could be a fascinating experience that you should try once to get back to prehistoric age. Put your open water bottles outside to collect rainwater, then purify the collected water with a filter and enjoy it. Be noticed that water running off the trees or rocks is already dirty, you shouldn’t drink it. 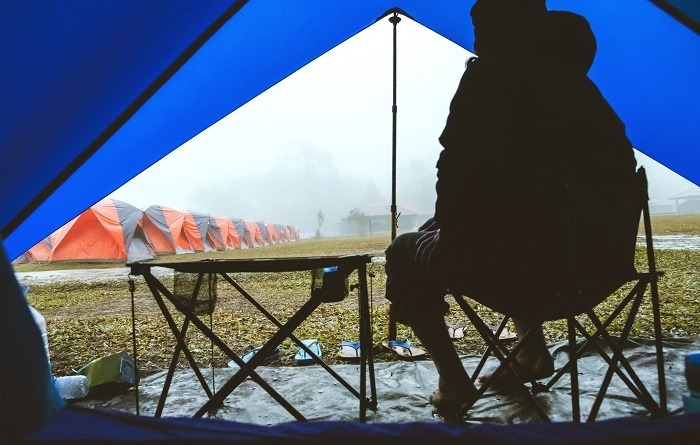 - Bring a raincoat: Raincoat is something that we can’t live without in rainy seasons and it becomes more important when you camping in the forest. - Bring at least two cigarette lighters: This is another must-have item when camping. Kindling a fire warms up your body when the temperature turns down. You should bring stand-by lighters if another one broke. - Set up a quick-lighting stove for cooking: Nothing could be better than having a burning hot meal during bad weather. While the rain pours outside, you could organize a small party with barbecue and beer inside the tent. - Food: Of course, you can’t forget to put food in this list because it is one the most important things. You should prepare to prepackage food, fruits, and soft drink for the sake of convenience during rainy days. - Waterproof trekking shoes or sandals: A pair of waterproof shoes or sandals is the must-have item when you camp in the wet forest, it protects your feet from injuries and falling flat on your face when walking in the slippery path. In addition, it is much more comfortable when your feet are dry and smell free. - Quick-dry towels and used newspapers: Pack some towels to wipe down wet tables or absorb water from your shoes and used newspapers to be used as a fire starter. 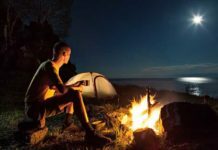 - LED lights and candles: Let’s light up the night with colorful LED lights draping around the campsite and some little candles creating sweet space. - Bring along your favorite tea: Reveling in camping with best friends or your lover in a romantic atmosphere with lights and sipping your most-liked tea when it’s raining outside will be beautiful memories that you’ll never forget in your whole life. 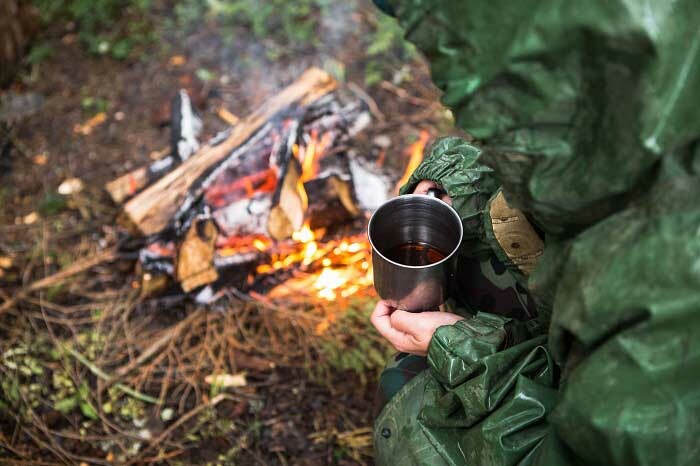 - Prepare at least one extra set of water-resistant clothing: Depend on how many days you stay in the camp, bring a sufficient number of water-resistant clothing. Quick-drying clothing which made from synthetic fibers such as nylon would be perfect. Avoid cotton clothing because it’s easy to soak and take long hours to dry. Moreover, when cotton clothing is wetted, you are easy to catch a chill and have a runny nose. In addition, pack merino wool for the sake of warm keeping when the night falls and the temperature is suddenly decreased. - Sleeping bag: Sleeping outside could make you toss and turn during the night, especially when you don’t sleep on the bed. Therefore, remember to bring a soft sleeping bag, it will comfort you and help your body get the rest. - A camera: Camping is all the about the fun and I’m sure that you definitely want to keep your amazing and beautiful memories. So it is practical when bringing a camera with you. - Heat-keeping bag: Remember to bring heat-keeping bag along to warm up your body in case it turns colder. Protecting your health is never be too late. - Bring a hiking stick: Because of the constant rains, the alleys could be slippery and difficult to move. Hence, remember to use a hiking stick while walking to make sure that you won’t fall down. Take a look at my camping in the rain activities list below and have a good camping time. - Play cards: For me, playing cards is always the best game ever because we could easily play with strangers without any hesitation and it could help us to relax and strengthen friendship. The card game is suitable for 3 to 4 people to play. - Play a board game: Similar to playing cards, playing a board game is also an entertaining game when hanging out in a tent or passing a wet-weather day. Setting up a battle of wits in the tent will warm up your brain energy and make you forget all the unpleasant noise of the rain pour outside. - Tea talk with your best friends: In the normal days, we’re usually caught up in the hustle and the bustle of the city life, we hardly have time to enjoy a tea talk with people who are important to you. Therefore, while camping outside in a delightful environment, why don’t we make a hot cocoa or brew tea and begin to confide in our friends. - Have a puddle splashing contest: It has been a long time we don’t do something crazy, it’s time now. Let’s be a fool a little bit and act like a child, let’s have a puddle splashing contest. It’s really funny and entertaining no matter how old you are, you’ll have a ticket to your childhood with this game. Let’s see who can splash the highest. - Make mud pies: May this game brings the memorable childhood’s memories back to you. Gather some mud and stones, mix it carefully together, knead the mud into several shapes and add some wild fruits, weeds, dried leaves for the decoration. And tadaaa, you’ll have a fresh and colorful mud pie. - Sing camp songs: Of course, campfire songs are indispensable “spice” of the camping. Bring your dear guitar and sing out loud with your friends to drown out the rain sound outside. How fun and exciting it is! I bet you’ll never have this feeling a second time. - Save the worms: Becoming a superhero is never that easy. Let’s transform and help little poor worms. After long hour rain, worms will be pushed on the ground. After the sun rises, the unlucky worms who can’t back into the ground timely will die. Therefore, your duty is to help the poor worms out by catching them and put them in the mud. - Make a water slide: Making a water slide is one of the most favorite camping in the rain activities because it is amusing and brings us back to our childhood. Prepare a long enough slide or the tarp on the hill and sprinkle some baby oil to increase the slippery level. Attach the tarp on a fairly sloping and flat road, eliminate obstacles on the road such as branches, rocks, etc,… to ready to “slide to the heaven”. - Have a rain race: For me, happiness is all around us. Sometimes, I feel cheerful just by watching raindrops dropping from the window or another flat surface. Each people choose their own drops and wait for whose drip reaches the finish first. Every garden has it weeds, therefore don’t be hastily upset or discouraged when something didn’t happen as your will. Camping in the rain could be dangerous, cold and chaotic but you could turn it out to be a remarkable, meaningful and enjoyable experience when applying the tips, bringing adequate gear and playing some games that I wrote down above. Hopefully, you will have such a joyful attempt. 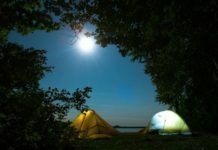 Please share this article if you found it helpful and comment on your wonderful ideas, tips, and hacks when camping in the rain. There are some great tips here! My other half loves camping in the rain but I have always hated it. It probably doesn’t help that every time I’ve got caught out with a leaky tent though!